Toronto home sales have stabilized, but the Greater Toronto Area’s rental market remains hot. Rental availability in the city is low and prices continue to increase. The average monthly rent for a condo has grown by 11.2 per cent. As Toronto universities begin their new school year the influx of students arriving in the city has only aggravated the problem. The city has a number of schools in the area including University of Toronto, York University, Ryerson University, OCAD, and George Brown College. Students are often novice renters, which make navigating the intense market even more difficult. Rental properties around these areas are typically more expensive than other areas. A one-bedroom condo around U of T goes for about $2,400, while in other areas of downtown Toronto a one-bedroom goes for $2,100. According to Urbanation, a leading source of information and analysis on Toronto’s real estate market, back-to-school time nets the highest average rents in a year. Real estate agents say the students rental market is not any busier than last year. However, there are fewer properties available, prices are higher, and it is not uncommon for a property to be rented within an hour of listing it. Students looking to rent off-campus often struggle to find affordable places. While most of the universities and colleges in the city offer dormitories, these are reserved for first years and have limited availability. University of Toronto’s downtown campus dorms can accommodate around 6,616 students but have 43,820 undergraduate students enrolled. The hot rental market is one reason why Chinese investor’s purchase property for their children attending school here in Canada. Due to the competitive market and low availability, landlords can pick and choose their tenants. Landlords often sell students units sight-unseen, require a parental co-sign, or ask for months of rent in advance. It’s not uncommon to see bidding wars for condos that rival that of high-end homes. Since students lack many of the required items needed to rent in Toronto, such as credit scores, large budgets, and employment letters, their options are limited. 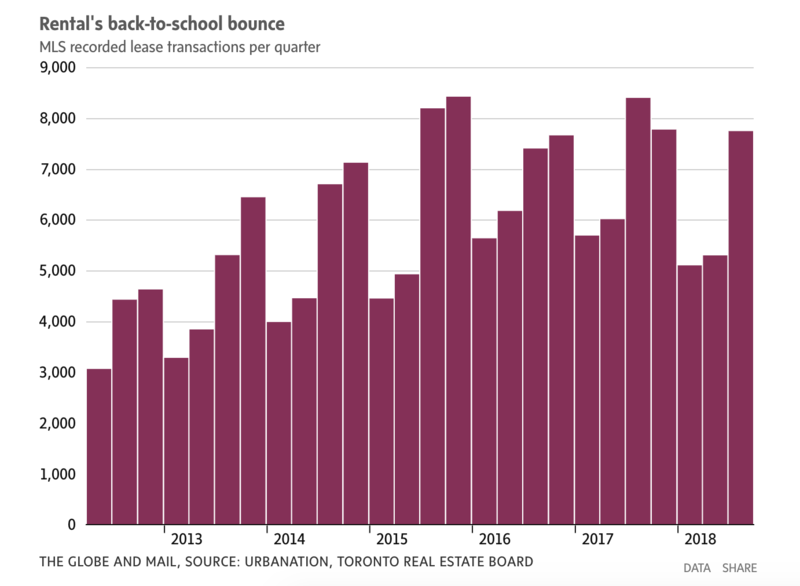 The good news is that back-to-school rental madness will die down shortly. All past data indicates that the market will stabilize once school is in full swing. A number of new condo buildings are currently under construction, and once completed will help alleviate the pressure on the rental market. Toronto’s continues to be one of Canada’s most desirable and its housing market is booming.